BTSE is a multi-currency, licensed digital asset trading platform catering to companies and individuals alike. It delivers innovative, good practice to the global finance community with high liquidity and fast settlement in a trusted and safe environment. Founded by a team of financial services professionals, the platform offers state-of-the-art services for institutional and individual traders. The company is registered and licensed as BTSE Commercial Brokers LLC (814684) and BTSE Payment Service Providers LLC (814678) by the Dubai government’s department of economic development. It is regulated by the Central Bank of United Arab Emirates, so it’s solid and trustworthy. At present, BTSE Limited (Malta) is undergoing a Virtual Financial Assets Act Class 4 Cryptocurrency Exchange License application procedure from the Republic of Malta. Principle approval to operate has been granted. The company caters to traders from across the world. The website does not list any banned countries. Verification typically takes less than one day. Users register for an account on the website and provide information in accordance with all applicable laws, such as AML laws, CTF laws, and anti-bribery laws. During the registration process, users undergo know-your-customer (KYC) checks to prevent crimes like fraud and money laundering. You must provide an ID document, a copy of a bank statement, and any other documents that may be required by the platform, such as proof of address. A recent copy of a utility bill would suffice. The full list of details is in the Terms and Conditions Section. There is no limit to the amount of digital and fiat currencies that can be traded. You may begin trading once you have created and completed the email verification. To trade fiat currencies, you go to the identity verification page and provide “Identity Verification” documents. Level 1 verification mandates your full name, date of birth, phone number, country of residence, and citizenship. Submission of a valid driver’s license, passport, or national ID card would fulfill ID verification requirements. Keep in mind that Level 1 is the most basic. It is followed by Level 2 Verification, which involves proof of residential address. You need to provide valid proof of address, such as a utility bill, credit card bill, bank statement, or mobile phone bill issued within the last 3 months. The name on the document should match that on your photo ID. When this is done, just click on Submit. The next stage entails review by BTSE. BTSE reviews and approves your “Identity Verification”. The next step is to add bank account information. On the upper-right corner of the page, there is “Log in”, followed by “User Name”, “Account”, and “Bank Account”. Here, you add your bank account and some other required information. It is entered in a pop-up window. Then, press “Confirm”. Clients registered with BTSE can choose from a number of base currencies, including EUR, USD, KRW, MYR and PHP. Then, the currency is either transferred to the platform or users just trade with their base currency. All the liquidity is sourced from one order book in USD. BTSE tries to overcome the downside very ostensibly present on many similar platforms, namely that most exchanges that have different markets in a wide variety of fiat currencies do not dispose of liquidity in their secondary markets. This is a clear disadvantage to users that want to trade in their local currency. 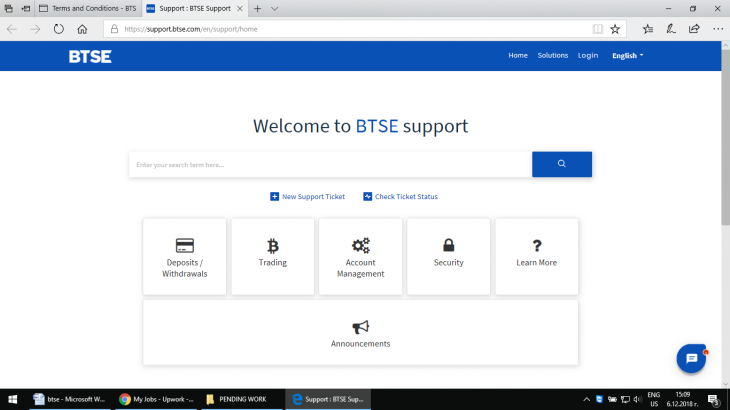 BTSE supports trade in the Bitcoin (BTC) and Tether USD (USDT). Some of the features traders have available to them are index pegged orders, hidden orders, BTSE 10 (Altcoins), the BTSE 5 (core coin), and the BTSE Single Token indexes. These cover the prices of important virtual currencies such as Ether, Bitcoin, Bitcoin Cash, and Litecoin. 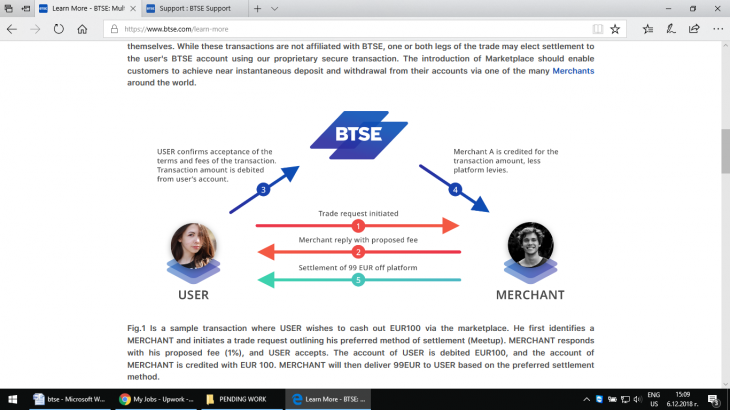 BTSE Exchange employs a maker and taker fee model. BTSE determines the account VIP level based on a one-month rolling window of trading volume, which is recalculated once a day. Clients log into their account profiles to see their current VIP level. Trading volume is calculated in Bitcoin. Trading volume in another currency, whether digital or fiat, is converted into Bitcoin-equivalent volume at the currently valid exchange rate. 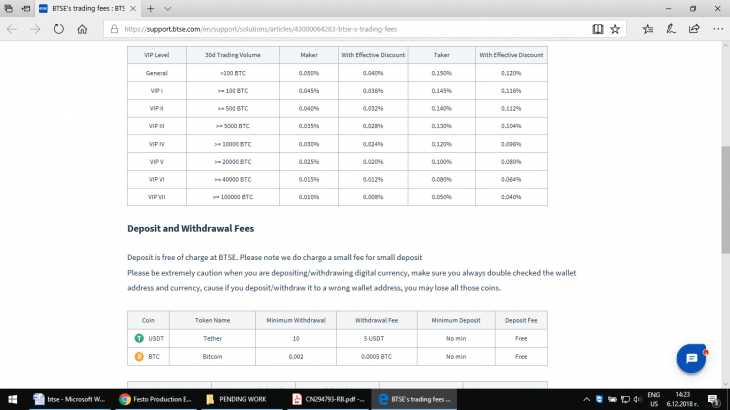 BTSE does not charge any fees on deposits. There is only a negligible one on small deposits. Users are advised to exercise extreme caution when depositing or withdrawing digital currency. All coins can be lost if one makes a deposit or withdrawal from a wrong wallet. The wallet address and currency should always be double-checked. The minimum withdrawal amount if you’re trading in Tether is 10 USDT, and the fee is 5 USDT. There is no minimum deposit amount and no deposit fee. If you choose to trade in Bitcoin, the minimum withdrawal is 0.002 BTC, and the fee is 0.0005 BTC. Again, there is neither a deposit fee nor a minimum deposit amount. If you choose to trade in US dollars, the minimum withdrawal amount is $1,000, and the fee is 0.1%, but at least $25. The minimum deposit amount is also $1,000. No fee is charged on the deposit. Fiat currency deposits may be charged a bank fee. This fee is payable to the bank, not to BTSE. If a trader deposits less than the equivalent of $1,000 in cryptocurrencies, a small deposit fee may be charged. This fee will amount to 0.25% or the equivalent of $3, whichever is more. The small deposit fee is charged in the respective digital currency. To buy or sell digital currencies, you need to log in, then go to TRADING and select the digital currency. You choose the Buy/Sell method under “MARKET / LIMIT / INDEX”. You can see your transaction status, details and history under “OPEN ORDERS” at the bottom of the Trading page. Here, you can view your pending transactions. Orders are also canceled under the “OPEN ORDERS” tab. You must be at least 18 to trade on the BTSE exchange. If no matching transactions are currently available, your order may be stuck as “open order”. 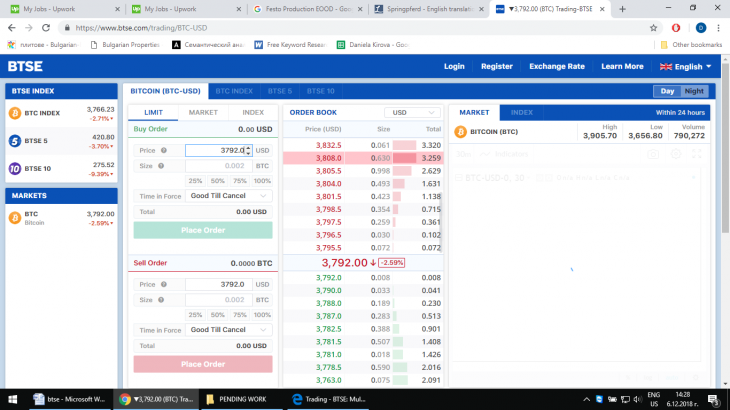 Under “ORDER BOOK” you can view all open sell or buy orders from all of the platform’s users. There is no limit to what you can trade after you’ve completed the “Identity Verification” process. BTSE Market operates as a P2P marketplace where sellers and buyers meet to carry out independent transactions. 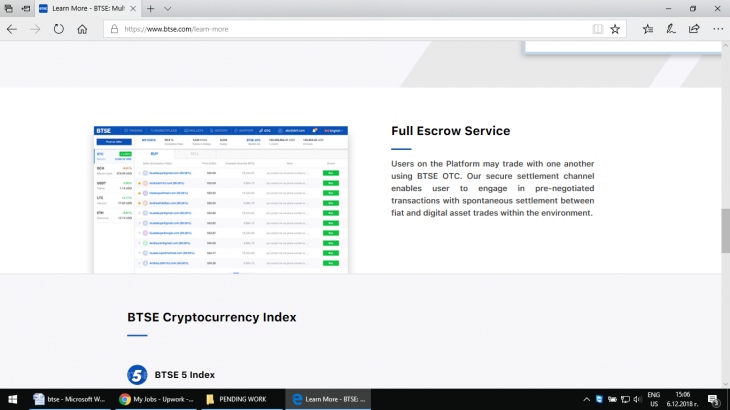 One or both parties to the trade may elect settlement to the user’s BTSE account utilizing the platform’s proprietary secure transaction even though these transactions are not affiliated with BTSE. The introduction of the marketplace should make it possible for clients to achieve near instantaneous withdrawal and deposit to their accounts through merchants. 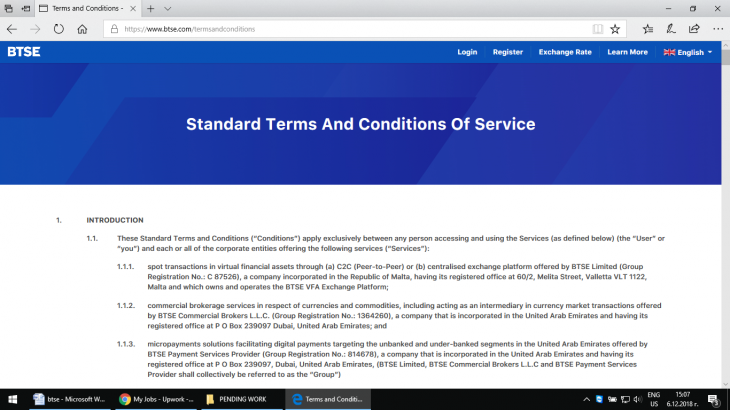 The BTSE website provides no indication of the platform’s supporting derivates, futures, or margin trading. Above, you can see a sample transaction where a trader wishes to cash out a certain amount via the marketplace. He first finds a MERCHANT and makes a trade request specifying his preferred method of settlement. This is called the meet-up. The MERCHANT responds with his proposed fee and the USER either accepts or denies the offer. The account of the USER is debited by the respective amount, and that same amount – for example USD 200 – is credited to the account of the MERCHANT. The MERCHANT will then deliver the amount minus the fee to the USER based on the preferred settlement method. A user may also apply to become a Merchant in the marketplace in line with increased KYC requirements and subject to platform approval. Once approved, WTB (Want to Buy) and WTS (Want to Sell) offers can be made by the Merchant at the marketplace forum, where users can check the information of interest and transact directly. The website of the platform features a wealth of useful information, starting with how to create a digital currency wallet. When you go to Log-in and “WALLETS” in the upper left corner of the page, you must click on “Deposit” under the digital currency window. Then, select “Create (Currency) Address”. Of course, being able to make withdrawals is just as important! To withdraw digital currencies, you go to Log-in and “WALLETS” again, only this time you click on “Withdraw” under that window. Then, enter the amount you wish to withdraw and the address you want to withdraw it to and press “Confirm”. Confirmation windows will pop-up with the purpose of address verification. As we mentioned, it’s important to specify the correct address, else you risk losing the funds. When you establish that the address is correct, just press on “Confirm” to move forward with your withdrawal. Support is available by chat, phone, and email. Response time is under 24 hours. Above are the main support categories. As you can see, they are security, account management, trading, and deposits / withdrawals. Again, this support section features a wealth of useful info and answers to frequently asked questions such as how to deposit fiat currency or digital currency to your wallet. One way to make a deposit is via SWIFT remittance. You get your transaction number and bank information to do this under “Log in” > “WALLETS”. Under “Deposit”, you create your digital currency wallet address. If your balance shows less than what was deposited, your bank may have changed its fees. You can view all SWIFT remittance fee types on the platform’s site. To withdraw fiat currency, you go to SWIFT Remittance Log-in and “WALLETS” again, this time clicking on “Withdraw” under the fiat currency field. Enter the amount you want to withdraw and choose the bank account you want your currency to be withdrawn to. The process of withdrawing digital currencies is somewhat similar. You go to “WALLETS” and “Withdraw” under the digital currency window. Enter the amount and choose the account where you want the money to go. Again, be careful to select the right account. It is also possible to add multiple bank account information for withdrawal of fiat currency. Go to “Log in”, “User Name” in the upper-right corner of the page, “Account”, and “Bank Account”. Here, you add as many accounts as you want. You can view the status of our withdrawal or deposit request under “Login”, “WALLETS”, and “Details” (under fiat currency). It is under “Status”. Withdrawal/deposit requests can also be changed. Just press “cancel” on the wallet page before BTSE processes your request or submit a new deposit request. This platform has never been hacked in the past, testifying to its solid level of security. In compliance with international security standards, it offers two-factor authentication. This layer of security is of paramount importance to your BTSE account. It is aimed to make sure that nobody accesses your account but you. Users need to enter a time sensitive code to authorize your session login after they enable two-factor authentication (2FA). To activate it, they need to download and install the “Google Authenticator” mobile app. For iOS, this is done by opening App Store App search “Google Authenticator”. For Android, you need to open the Google Play App and search for “Google Authenticator”. Then, you add “BTSE” into your “Google Authenticator” mobile app under “Login”, “User Name” (on the upper-right of the page), and “Account”. Go to the “Security” tab, then “Setup 2FA” in the 2FA section. You proceed by opening your “Google Authenticator” mobile app and pressing “+”, then “Scan a bar code”. BTSE will generate a code from App > Enter. After selecting their base currency, users trade with it or transfer their currency to the platform for storage. The platform sends out encrypted emails. If you’re not receiving them, this could be because you marked BTSE emails as spam by accident and they are now going to your spam folder. To sum up, here is a brief list of the platform’s upsides and downsides. No mobile app, but site is optimized for mobile use.